A recent article in the Guardian analyzed how technology could potentially make urban planning processes more transparent to the general public. In the article, a myriad of tools are mentioned- such as the CitySwipe and Flux Metrowhich bring future or proposed changes to a particular neighborhood or site to people’s fingertips for preview. Most of these tools aim to let residents comment or vote on proposed developments around their neighborhood. The article alludes to these tools being the Tinder of urban planning- imagine a tool where anyone could swipe right or left to approve or veto new developments in their neighborhood. One particular tool, UrbanPlanAR platform, even makes use of virtual reality so people can have an idea of what a specific project will look like within its real life context. In New York City, the amount of apps and tools built to better understand or interact with the built environment is growing. From the city-sponsored competition Big Apps, through New York Public Library Lab’s, OldNYC to maps featured in multiple news outlets, such as the shadow map recently posted in the New York Times. In this context, where we interact and operate in a city constantly evolving and changing at a rapid pace, where market forces stretch the limit of zoning and building codes, and the Department of City Planning, the Department of Landmark Preservation and other government agencies struggle to keep pace- what is the role for preservation? And, most importantly, how can the practice of historic preservation benefit from the use of technology, data, and readily available tools such as Google maps? Historic preservation – or preservation as it is now more commonly referred to- is now moving away from historical or cultural preservation, to the preservation of neighborhood character. Preservation is often understood as the practice that aims to protect, preserve, and conserve buildings, landscapes, or other elements that have historical significance. This proposal aims to expand the discussion as it relates to technology, people, and how we interact with our built environment. For this purpose we propose a new Google Maps Community Preservation Layer that allows communities to easily identify and document the buildings and uses they would like to preserve in their neighborhoods. Data can be gathered just as reviews and other data is gathered today in Google Maps – by people inputting their comments and ratings into a pre-established questionnaire format. Since no two sites are alike and no two communities are alike, we propose a framework that it is flexible enough to allow for communities to adjust the questions and data that would come out of it. As communities engage in this process, they generate the type of questions that would be useful for them. By being able to ask the right questions and having user-created content, preservation is taken out of the professional world and into the hands of concerned/interested citizens. Our proposed Google Maps Community Preservation Layer has the potential to redefine preservation processes and allow communities to define what their neighborhood character is and what assets are valuable to them. It can also change the way historic preservation is practiced today, and it could even shift traditional roles by placing an apparent responsibility on residents and community groups to make a case for their own historic preservation approach. In today’s Google Map experience, places of interest are highlighted as commercial corridors and visualized in a different color. The Google Community Preservation Layer uses these same visual treatment to highlight certain areas of interest and allow users the ability to comment on particular places and buildings. The Google Map Community Preservation Layer would allow for communities to easily gather and/or identify the buildings, uses, or economics they like in their neighborhoods. It is flexible enough to let communities tailor their inquiries and data collection methods to reflect what they care the most about and what they think makes their community special– in some cases it will be about the built environment, in others it could be about the possibilities enabled by the urban configuration, in yet other cases it could be about the affordability or an existing employment network. Building off the Google Maps traits, this layer could serve as an example of how existing technology can be leveraged to promote preservation, collect data on the ground, and allow communities –or other users- to input and in turn, use relevant data. The Gowanus neighborhood in Brooklyn is undergoing rapid change. A recently completed community driven plan, called “Bridging Gowanus” together with a recently launched Neighborhood Planning Study by the NYC Department of City Planning has spurred some speculations as to the future of the neighborhood. 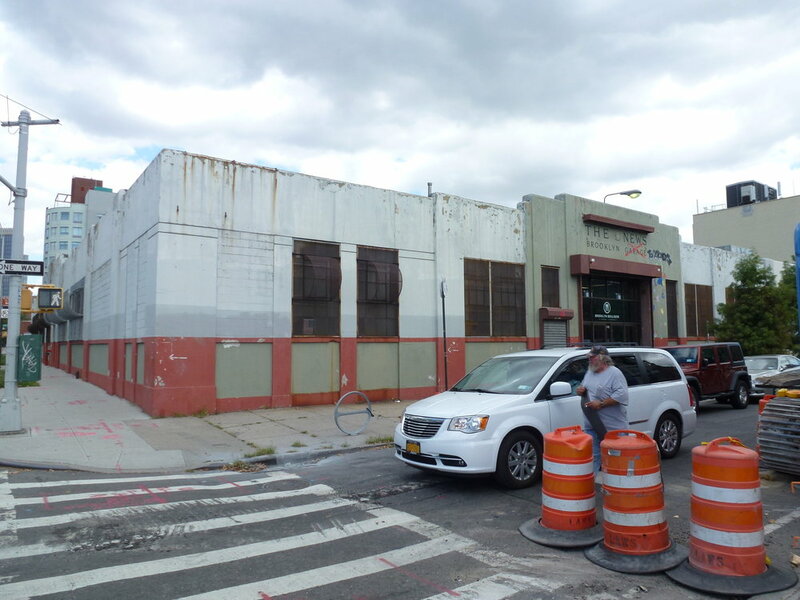 There are many civic and community organizations operating in Gowanus with multiple agendas and visions on what they would like to see happen in the future. So how can these organizations collaborate and conduct outreach in a more streamlined manner? How can they reach more residents? How can they communicate with other city and state agencies on what is most important to constituents? How can they shape the changing future without running the risk of stifling future growth of the neighborhood? The Google Map Community Preservation Layer can help multiple stakeholders have a source of information that is collective and easy to access. In the right image above , a “community preservation” area is shown in light red just like current commercial areas of are shown is light beige. This layer could be turned on and off on the left navigation bar. This area in pink can be highlighted to reflect the community’s priorities as they relate to historic preservation and neighborhood character. The BRT powerhouse, built in 1902, also known as the “Bat Cave” was once the home of the former Brooklyn Rapid Transit Powerhouse. It was a coal-fired plant that powered Brooklyn’s trolley system. The building has been abandoned since the turn of the 21st century and has housed squatters and celebrated graffiti. It is a very prominent building in Gowanus and is considered by the community as an asset to be reused for a community benefit. In recent years there has been much speculation about the feasibility of the building’s future. However, this information is only available to those who specifically know about the history or are searching specifically for the subject matter. When searching in Google Maps, there is no indication of the historic significance of the building. With the proposed tool, an organization like The Historic District Council for example, who included Gowanus and more specifically the BRT Powerhouse building in their Six to Celebrate Program, can now spread the word and include the building in a newly created Community Preservation Layer where they can upload historic images of the building, have the public rate it based on certain attributes, ask for a vote to save it and include links to relevant sites. More recent updates on the possible development of this site include an article in the NY times which revealed that the building will be renovated and expanded to house “a factory for the production of art” could also be incorporated into the newly created entry. Through this layer residents and community groups can now comment on the potential future use of the BRT Powerhouse and advocate for changes in the proposed scheme. The inclusion of these types of entries could also help residents learn more about their neighborhood and what their neighbors care most about. More recently, some areas in Gowanus emerged as clusters of certain activities such as gyms, climbing walls, and other type of exercise-related activities. Degraw Street, for example, became a street which attracted uses focused on physical activities. These buildings used to house industrial uses, and their open floor plans allowed for easy conversion. With the proposed land use changes in the Gowanus Neighborhood Plan currently underway, the Google Map Community Preservation Layer could help these business owners and local residents communicate the significance gyms hold in this changing neighborhood fabric for their neighborhood character. The new visual identity could make it into the public realm and draw a connection from the online tool to local residents. This type of augmented reality helps inform all stakeholders of the significance of the place and help them participate in the consultation/preservation process. One of the main challenges in New York City’s changing landscape is dealing with both the negative aspects associated with change and the technical process involved in preserving the built environment. The Google Map Community Preservation Layer aims to bridge this divide, by making preservation an accessible process and allowing for a community-led process to influence development forces. If we acknowledge that constant change is the city’s trademark, preservation becomes more complicated. Since the Google Map Community Preservation Layer is embedded into everyday life, it can be reshaped from the scale of the individual to the scale of whole neighborhoods. The Google Map Community Preservation Layer empowers citizens to identify those buildings and uses that they value most and wish to maintain, while at the same time creates enough content that developers and city officials could use to inform their planning processes. However, The Google Map Community Preservation Layer can raise valid questions as to who are the users entering the data, how closely related are they to the community at question and at what point has an area of interest collected enough data to represent a collective choice. Another question raised is the potential for this data to be manipulated and used at the algorithmic level by Google or others. Even though the tool might have drawbacks, having a tool such as this one could be especially useful at a time when a neighborhood is undergoing changes that might be perceived differently by the various neighborhood constituents. Today, when government agencies are constantly in search of innovative ways to engage communities, using this type of tool to empower community residents could allow for communities to be more involved in the planning and preservation processes and shape various development outcomes.